Employee attendance software - TimeOff is the ideal employee absence tracker. Keeping track of time off and benefit hours earned can be a nightmare for any employer. Even with the help of software, it is often a complicated, time-consuming ordeal which leaves you feeling tense and frustrated. And in today's ecomony, we all need to be as productive and efficient as possible. With TimeOff, employee attendance tracking is a completely new experience. This accurate, fast and easy-to-use employee absence tracker will keep you up to date with the minimum amount of effort and stress. TimeOff is surprisingly simple to use, and you'll be pleased to discover that it adapts to the rules of your business rather than the other way around. 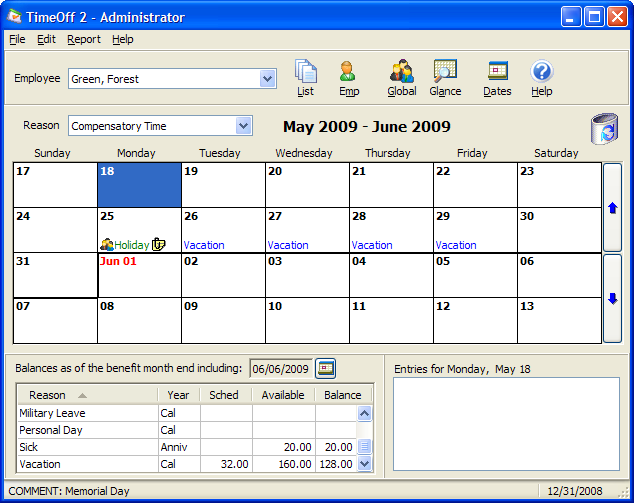 With a drag-and-drop interface, this flexible employee attendance software makes it quick and easy to enter data. A benefit policy wizard helps you enter benefit policies, and the main screen lets you keep track of benefit hours for each employee. Employee absence tracking has never been easier! This employee attendance software also lets you create a number of useful reports. You can create a Time Off Taken Report, which prints out all the time off entries for selected employees for any time period, in detail and summary formats. You can also create Time Off Balances report that shows how many benefit hours the employee has earned, taken, and the remaining balance that you can distribute to your employees. A Month Calendar Report lists time off entries in calendar format. And there are many more, each with a number of selection options. Start keeping track of employee attendance and absence today! Click here to try our free 45 day trial, or better still, buy a fully licenced copy of the software, starting at $99.95. Click here for a full-size version of the main screen of our employee attendance software.